Are you tired of all of the run of the mill floorings that everyone else has? Tired of having to settle for a subpar flooring option because you are on a time restriction or just don’t want to deal with the headache of going through every single flooring option there is at the home improvement store? Well, for our neighbors in Dallas we have great news! We are offering our installation of the stunning metallic epoxy flooring system that will turn your home or business facility into a spectacle all in its own. Don’t know what metallic epoxy is or how metallic epoxy is going to work for you? Our goal is to enlighten you on the material, the process of installation and what you can expect from your flooring after it has been installed. Allow us to tell you why metallic epoxy is the best flooring you can have, please read what we have laid out for you down below. Wondering what the big deal is about epoxy flooring is or how it separates itself from other forms of epoxy flooring? The same materials that are used for standard epoxy flooring. The mixture is a three or four part system and consists of the epoxy resin, an epoxy hardener, metallic pigments and in some cases colorants are added in as well. What happens when the metallic pigments are mixed in with the epoxy forms a material that sparkles like no other flooring. 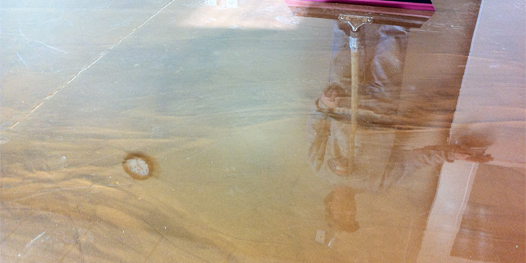 Most customization of the flooring actually comes from what happens after the epoxy is applied. What most people do once the base coat is applied to add more metallic pigments to add even more effect. Once the epoxy is applied, there is a wide variety of ways to manipulate the epoxy to get the desired effects, the most common being the use of back rolling or solvents. How Is Metallic Epoxy Applied? When it comes to the application of a metallic epoxy flooring system, the process will differ quite a bit from the application of the traditional concrete floor. Metallic epoxy flooring should never be confused with the epoxy that you can buy from the local hardware store, the epoxy you get from the store is paint with an epoxy additive. Metallic epoxy is a 100 percent solid epoxy system so it is as durable as they come. To apply this type of epoxy flooring system, there is a process of preparation that must be completed first, and once the flooring is properly prepared, only then can you apply the epoxy. While other epoxies can either be trowled or rolled on, metallic epoxy flooring is squeegeed on and the use of a spiked roller is used after to remove any possible air pockets. The method of maintaining a metallic epoxy flooring system is a simplistic process, but simplicity doesn’t mean you are able to hold off on doing it. We beg that you maintain a low traffic area at least twice a week and high traffic areas at least once a day. Since a metallic epoxy floor doesn’t need any type of waxes or polish, all you will need to maintain your metallic floor is either a soft bristle broom or a dust mop and a standard wet mop. 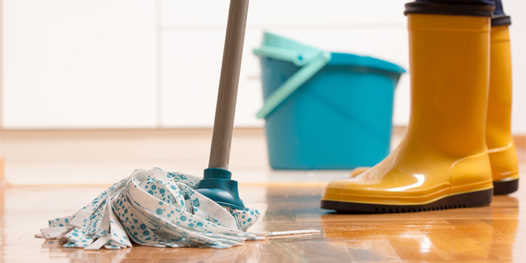 There is one task that must be completed before using a cleaner on your flooring while moping. Always test all chemicals before you use them on the entire metallic epoxy floor or you may run the risk of turning the flooring cloudy and ruining the top coat. The best feature of having a metallic epoxy floor installed in your home or business facility is the flooring is full of benefits. Just because the flooring is more attractive then standard epoxy, you don’t lose any benefits of a standard epoxy flooring, you will actually find there are more benefits to be had with a metallic epoxy floor! Unmatched Durability One of the most well-known benefits of metallic epoxy flooring is its brute strength. 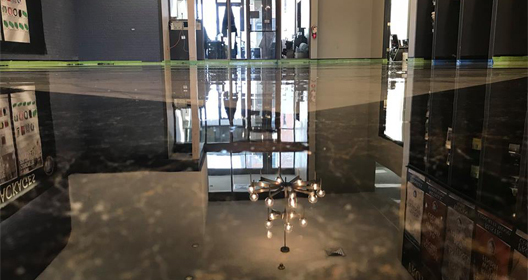 With a metallic epoxy in place, your home or facility will be able to handle dropped objects, scratches and abrasions, and even heavy foot traffic. Metallic epoxy is as strong as it is beautiful, and it is one of the most attractive flooring systems ever. USDA Approved Flooring Metallic epoxy has the honor of being one of the few flooring options to be approved by the USDA for use in food, beverage, and even medical facilities. This is because metallic epoxy has a seamless surface that is easy to disinfect. Brighter Area Another benefit of having a metallic epoxy installed in your home or facility is that the reflective top coat on the epoxy can actually make the areas seem up to 300 percent brighter without the use of additional lighting sources. Long Lifetime All epoxy flooring systems including the metallic epoxy floor have to ability to last for years and years. When the metallic epoxy is properly maintained and installed, the flooring system can last well over 20 years! There is a problem that is common among homeowners and that is the garage. The garage is an area of the home that is full of potential, but without the proper flooring, it can seem boring, dark and dirty. Bare concrete that is most commonly used in the garage is very easy to stain, crack and in most cases, the abuse it sustains in the garage makes the concrete slab rapidly deteriorate. 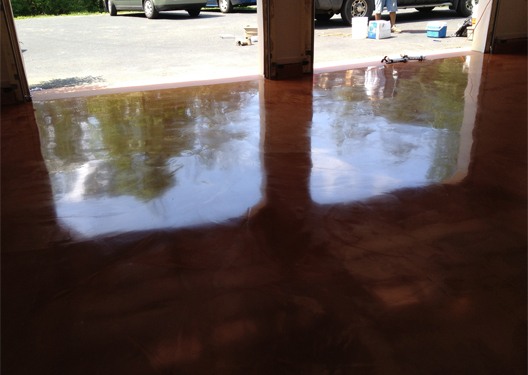 This is where metallic epoxy comes into play; metallic epoxy is the perfect flooring for your garage. It can make the area much brighter as explained above and it is resistant to stains and even chemicals. This is critical in the garage as we often use the garage as a storage area or as a workplace so you need flooring that is able to defend your concrete slab and that flooring is a metallic epoxy garage floor!